Providing children’s party entertainment for 25 years across Reading, Berkshire & surrounding areas. A little bit about us – we were established over 25 years ago to bring professional, friendly and reliable children’s entertainment to Reading, Berkshire, in the form of magic shows, fast expanding our repertoire to full party entertainment. More information can be found on our “Other Services” page. Today, we supply happy customers with balloon modelling in Reading, Basingstoke, Guildford, High Wycombe and Berkshire. Call us now to avoid dissapointment on 07796 095372 or email us from our “Contact” page. Our lady artist supplies a personal polite service, allowing even the most timid to feel relaxed. A selection of her fun, colourful creations can be found in the gallery and on the facebook page, which also includes extra reviews from balloon modelling in Maidenhead, Newbury, Bracknell and Wokingham. We work hard to meet all our customers needs, creating new models when required, so no matter where your party is, from balloon modelling in Henley On Thames, to Fleet, you will be sure of a stree free time. Our motto is that all the youngsters go home with a model of their choice. Call us now on 07796 095372 or email us from our “Contact” page. 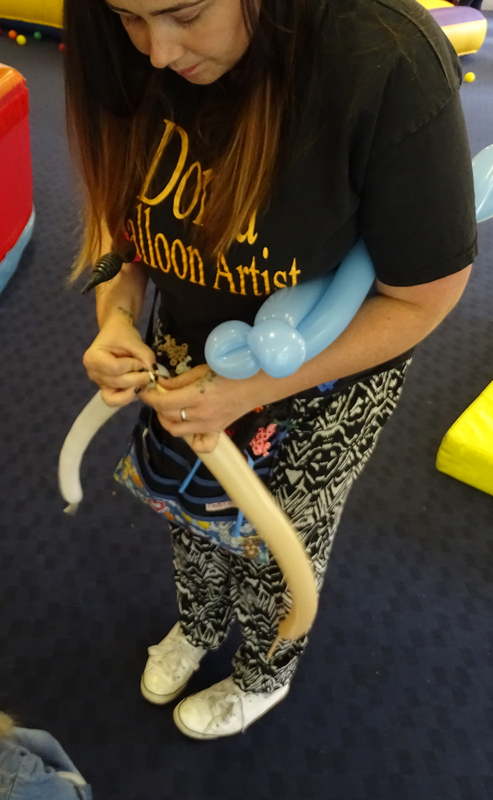 How can I choose the correct childrens balloon entertainer for our event? If starting from scatch, look at their website/facebook page displaying evidence of reviews and creations, feel free to discuss particular requirements from swan balloon modelling in Staines and Egham, aircraft balloon twisted in Farnborough and Heathrow or horses balloon modelling in Windsor and Ascot. In the above text weve highlighted just a few examples in general we offer balloon modelling/twister Woking to Oxford, Uxbridge to Swindon. What would I expect to pay? Unlike other we firmly believe in a fair market price with NO hidden extras and NO hidden add ons such as materials and travelling expenses. We DO however offer a fair and stress free time with an all in one price. Each child at your party to take home at least one model of their choice with an average of 20 per hour. If you have specific questions, then please feel free to call us on one of the numbers below. Please note that as full-time professionals, you may be calling while we are performing at a party, so leave a message and we will get back to you as quickly as we can. Alternatively please fill in the form on the right with as much detail as you can.